Non-missile penetrating head injuries (with objects travelling at a speed less than 100 m/s) in children are not uncommon due to their thin skull bones coupled with their exploring nature and lack of proper judgement. We report a case of brain abscess caused by a penetrating injury to the vertex by tip of a top, which is a commonly used toy in India, especially in rural areas. Rural set up, wooden top with a rusted tip and a penetrating injury to the head could be a lethal combination in our country. A 7-year-old boy presented with headache and left hemiparesis of 4 days duration following a penetrating injury to the vertex with the tip of a top. On examination, his Glasgow Coma Scale (GCS) score was 14/15 (eye opening 4, motor 6 and verbal 4) with bilateral papilloedema. There was grade 4 power in the left upper limb and grade 0 in the distal muscle groups of the left lower limb. On examination of the scalp, there was a 3-5-mm puncture wound in the scalp, 2 cm from the midline, in the vertex on the right side [[Figure 1]a]. Examination of the wooden top revealed a rusted tip [[Figure 1]b]. Computed tomography (CT) scan of the brain revealed depressed bone fragments at the entry site in the right parietal bone. Magnetic resonance imaging (MRI) of the brain revealed a 4 cm-sized, ring-enhancing lesion in the posterior and medial part of the right frontal lobe with significant perilesional edema and midline shift [Figure 2]. He underwent an emergency craniotomy, drainage of pus and subtotal excision of the abscess wall (posterior part of capsule close to the motor cortex was left behind). The pus culture grew Staphylococcus aureus and, as per the sensitivity, he was treated for 4 weeks with IV antibiotics followed by 2 weeks of oral antibiotics. A repeat contrast CT scan of the brain after 6 weeks revealed no abscess, and his weakness in the left lower limb had improved to normal. Brain abscess as a complication of penetrating injuries with various objects like chop sticks, pencils, bamboo sticks, toys etc., in children is a well known entity. ,,,, These objects vary according to the geographic location; in Japan these injuries are caused by chop sticks (plastic and wooden), in India by wooden sticks and in western countries by lawn darts, whereas pencils are common culprits in all parts of the world. ,, Wooden objects are more prone to result in an infection; they can cause bacterial, fungal or mixed infections. Lawn darts are known to cause abscesses due to rare organisms like Pseudomonas and Clostridium. Miller et al. in their evaluation of periorbital injuries due to sharp wooden objects found morbidity in 74% of their cases, brain abscess in nearly 50% of the cases and mortality in 25% of the cases in the postantibiotic era. These injuries usually have a puncture wound at the site of entry and presence of cerebrospinal fluid (CSF) leak or brain matter, which are usually not noticed by an inexperienced primary health care provider. Usual portals of entry for penetrating objects are transorbital (due to the thin orbital roof), transcranial, transoral and transethmoidal. ,, Penetrating objects can cause depressed/comminuted fractures of bone at the site of entry, dural laceration with CSF fistula, intracranial injuries (hematomas, intraventricular hemorrhage, pneumocephalus, brain stem injury) and vascular injuries (infarcts, carotico-cavernous fistula). , Because of these reasons, evaluation of patients with suspected penetrating head injury should include CT/MRI of the brain to determine the extent of injury, trajectory and residual foreign bodies. , Apart from the primary cranial injury, these patients are at a potential risk of developing early or delayed septic complications, sometimes as late as 9 years later. ,, In patients with delayed presentation, both plain and contrast imaging is mandatory. The morbidity and mortality depends on the type of object, site of entry, trajectory, proximity or involvement of paranasal sinuses, extent of primary parenchymal injury, associated vascular injury, contamination of object, virulence of organisms and septic complications. Patients can develop various forms of cranio-cerebral infections; local scalp infection, subdural or epidural empyema, meningitis or brain abscess. Domingo et al. in their analysis of 54 cases with low-velocity penetrating cranio-cerebral injuries found septic complications in 43% and vascular complications in 9% of the children. 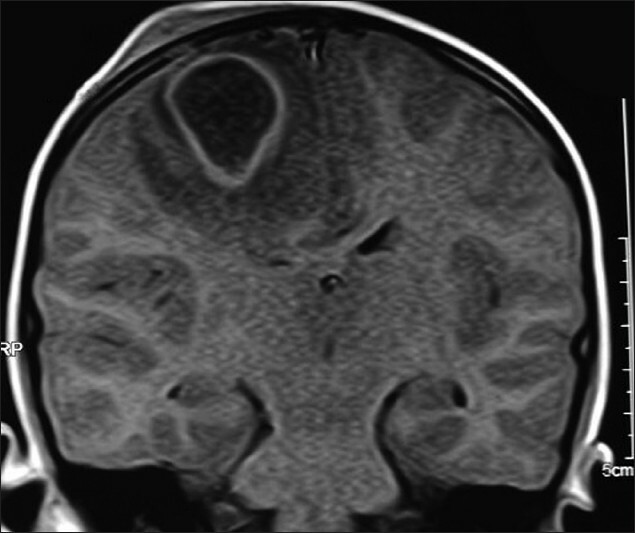 Site of brain abscess is usually around the fragments of the retained objects. ,, Brain abscesses can also form in relation to a paranasal sinus or along the trajectory. Cerebellar abscess due to a transorbital penetrating injury has also been reported. Surgical excision of the abscess (partial if in eloquent areas) or drainage of pus (if deep seated) followed by appropriate intravenous antibiotics for an adequate period of 4-6 weeks is the ideal treatment. Infections with organisms like Pseudomonas may require antibiotics for an extended period of time. Contrast imaging of the brain after completion of the antibiotic course is important to document the resolution of abscess. Evaluation of early or late presentation following penetrating head injuries in children should include careful clinical examination of the wound, high index of suspicion, appropriate imaging by CT/MRI, surgery if required and adequate treatment with antibiotics. 1. Domingo Z, Peter JC, de Villiers JC. Low velocity penetrating craniocerebral injury in childhood. Pediatr Neurosurg 1994;21:45-9. 2. Hiraishi T, Tomikawa M, Kobayashi T, Kawaquchi T. Delayed brain abscess after penetrating transorbital injury. No Shinkei Geka 2007;35:481-6. 3. Ishikawa E, Mequro K, Yanaka K, Murakami T, Narushima K, Aoki T, et al. 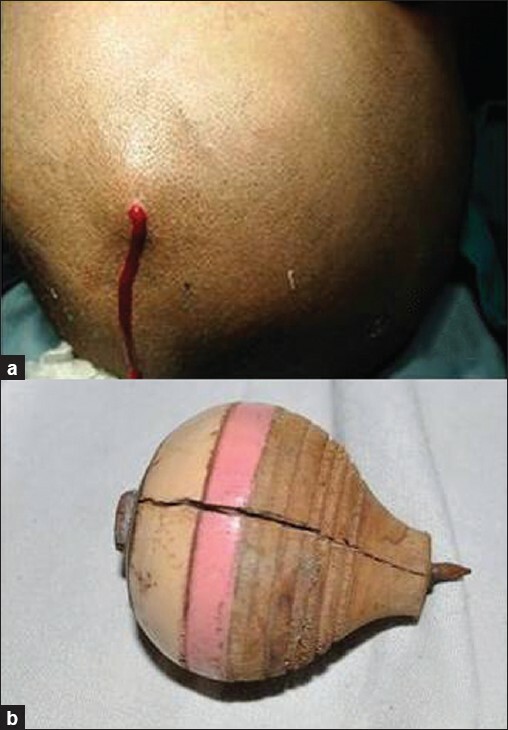 Intracerebellar penetrating injury and abscess due to a wooden foreign body-case report. Neurol Med Chir (Tokyo) 2000;40:458-62. 4. Miller CF, Brodkey JS, Colombi BJ. The danger of intracranial wood. Surg Neurol 1997;7:95-103. 5. Tiffany KK, Kline MW. Mixed flora brain abscess with Pseudomonas paucimobilis after a penetrating lawn dart injury. Pediatr Infect Dis J 1988;7:667-9.